“It was out of our conversations that the parallels and overlapping symbolism were uncovered and woven together,” Rabbi Baesh said. 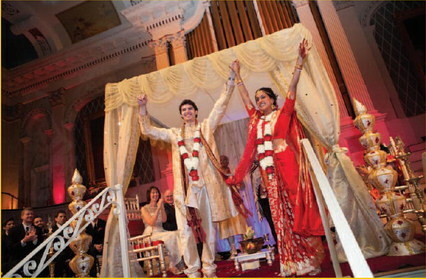 Danny Barker and Jhilam Biswas under their mandap chuppah. 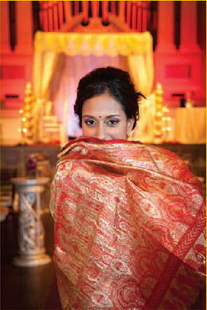 The baraat was actually a highlight of Jhilam and Danny’s wedding. Danny donned traditional Hindu clothing and rode a bejeweled horse down Worcester’s Main Street, all to the beat of the dhol (an Indian drum) and the rhythm of Indian music. The entire wedding party followed: dancing, clapping, laughing and kvelling. 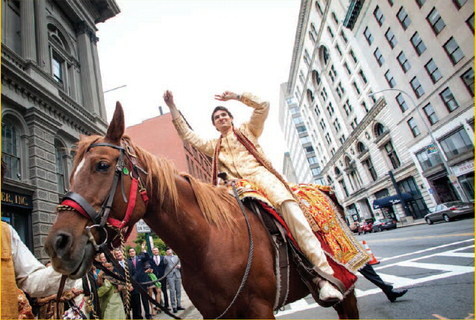 Danny Barker rode a bejeweled horse down Worcester’s Main Street as part of a baraat (Hindu marriage procession).